Can you shed some light on the custom of covering mirrors in a house of mourning? I was told that after the funeral of an immediate relative, we cover all mirrors in the home for the seven days of mourning. I have heard that the reason is that we are not supposed to adorn ourselves while in mourning, but I am looking for a deeper explanation. The Kabbalists give a more spooky reason for covering mirrors in a house of mourning. They write that all types of evil spirits and demons come to visit a family in mourning. When a soul leaves this world, it leaves a void, an emptiness that is prone to be filled by dark forces. This is because wherever there is a vacuum, negativity can creep in. And so the house of mourning, the place where the loss is felt the most, is a magnet for evil spirits. These demons cannot be seen by the naked eye. But when looking in a mirror, you may catch a glimpse of their reflection in the background. And so we cover the mirrors in a house of mourning because we don’t want to be alarmed by seeing these demonic visitors. Before we dismiss this idea as mythical nonsense, let’s try to understand it in terms we can relate to. Perhaps the idea of evil spirits can be interpreted on a psychological level: evil spirits can be thought of as inner demons. The ghosts that visit a mourner are regret, guilt and anger. 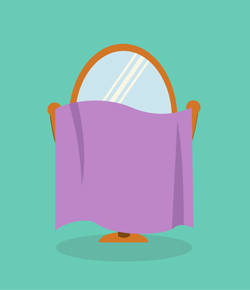 When people who are grieving take a hard look at themselves in the mirror, they often feel that they didn’t do enough for the departed, or that they didn’t say all they wanted to say, or that there are some loose ends, some unfinished business. Even if this is not really the case, even if they were exemplary sons or daughters, parents or spouses or siblings, our minds tend to play tricks, and we agonize over what could have been. These thoughts are the evil spirits that haunt the grieving, giving them no rest. So we cover the mirrors. We don’t want to look at those dark figures lurking behind us in the mirror. At a time of such raw emotion, when the loss is fresh and the heart is volatile, there is no room for harsh self-judgment. If there are unresolved issues, there will be time to deal with them later. But in the week immediately following the loss, we focus on the loss itself. Según tomado de, http://www.chabad.org/library/article_cdo/aid/2969340/jewish/Why-Are-the-Mirrors-Covered-in-a-House-of-Mourning.htm el jueves, 11 de junio de 2015. 1. R. Eliezer Chaim Deutsch, Duda’ei ha-Sadeh 78. Previous Post ¿Está permitido experimentar con animales según el judaísmo?